Our final news round-up of the weeks takes a look at the first names to be announced for this year’s Henley Literary Festival and the Indonesian poet who is facing complains of blasphemy. One of the largest book festivals in the UK, the Henley Literary Festival is in its 12th year. The festival will take place at a number of venues located across Henley-on-Thames from Saturday 29th September until Sunday 7th October. It is hoped that this year the festival will be the biggest they have managed to organise, and the organisers have released details of some of the first names in the literary world who have confirmed they will be attending. 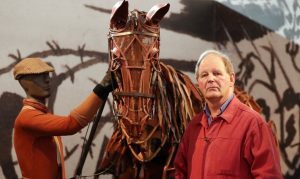 Sir Michael Morpurgo, the bestselling author, who received a knighthood earlier this year for his services to literature and charity has been announced as one of the first names announced for the festival. He is well known for his many children’s books including War Horse and The Wreck of Zanzibar. He will be making his appearance on the first day of the festival when he will be introducing his new book, which is due to be published in September; Magical Myths and Legends. Pam Ayres, the well-known poet, comedian and songwriter will also be making an appearance at the festival. A.F. Harrold, the performance poet has also been confirmed on the list of people who will be taking part in the festival. The organisers say that planning for the festival is still only in the early planning stage and they have over 150 other events that will be announced in the next couple of months. Last week during the Jakarta fashion show, poet Sukmawati Sukarnoputri, the daughter of Sukarno the founding president of Indonesia and youngest sister of the first female president in the history of the country, read a poem that sparked serious controversy. In the poem she described how Indonesian culture was far more preferable that the imported Islamic tradition that are on the increase in the country. The poem Ibu Indonesia (Mother Indonesia) was supposed to be an expression of the poet’s pride in her national heritage and in the immediate aftermath of the reading she said she was ready to defend her work. Two complaints were made to the police following the poetry reading, she was accused of insulting Islam and there were calls amongst the more hardline Muslims that she should be prosecuted for blasphemy. On 4th April Sukmawati Sukarnoputri gave a press conference at which she acknowledged that her poem had been controversial and apologised to any Muslims who might have been offended by it. Some of the groups who are protesting against the poem have stated that they still intend to lodge further complaints against the blasphemy. In Indonesia a conviction for blasphemy carries a jail sentence of a maximum of five years.